THIS NEW SOULDER RIG COMES WITH FULLY ADJUSTABLE YOKES TO FIT VIRTUALLY ANY SIZE PERSON. IN ADDITTION TO THIS ADJUSTABILITY WE OFFER QUICK DISCONNECTS ON BOTH SIDES WHICH MAKES THIS SHOULDER RIG TRUELY AMBIDEXTRIOUS. IT HAS DUAL WAIST TIE DOWNS, DOUBLE AMMO POUCHES, THUMBREAK RETENTION STRAP, AND SOFT LINING TO PROTECT THE FINISH ON YOUR GUN. 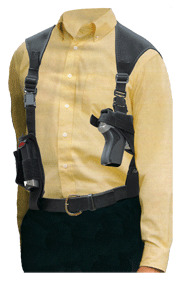 THIS SHOULDER HOLSTER IS AMERICAN MADE AND CONSTRUCTED WITH A HIGH GRADE BALLISTIC NYLON AS WELL AS BEING DOUBLE SEWN FOR YEARS OF DURABLE YET COMFORTABLE USE.